BOSTON—New research finds that three out of four U.S. workers have caregiving responsibilities, with the vast majority indicating these responsibilities are negatively affecting their productivity. At the same time, less than a quarter of employers think caregiving affects worker performance. The Caring Company, a new research report co-authored by Harvard Business School Professor and Managing the Future of Work Project Co-Chair Joseph Fuller and Project Director and Senior Researcher Manjari Raman, reveals this dramatic misalignment in America’s care economy. This growing crisis is adding millions in hidden costs to U.S. firms due to factors such as employee turnover and absenteeism, the research finds. 52% of employers do not measure and thus do not realize the extent to which their employees are burdened by care. Over 80% of employees with caregiving responsibilities admitted that caregiving affected their productivity. 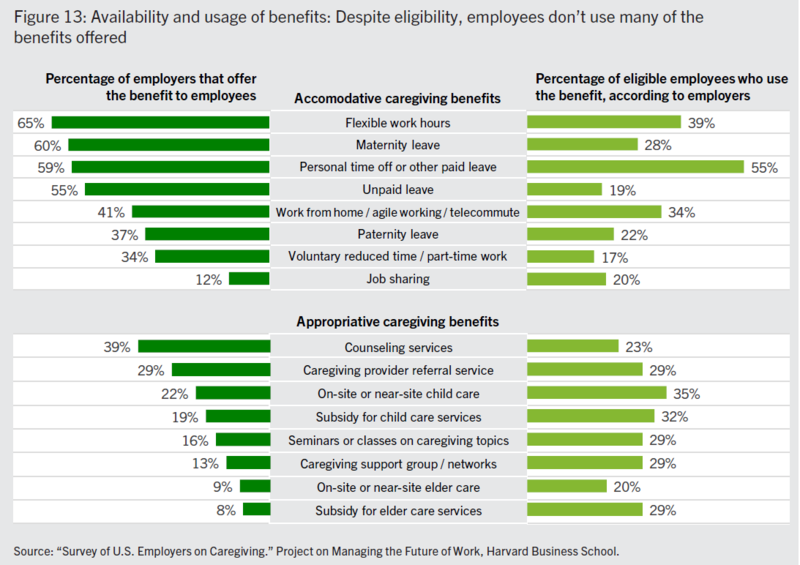 Despite these views, employers indicated that behaviors associated with caregiving obligations impede employees’ careers. Employers identified unplanned absences and missed days of work (33%), late arrival at work (28%) and early departure from work (17%) as the top three behaviors that undermine career progression. Caregiving contributed greatly to the churn of younger employees: 50% of employees aged 26-35 and 27% of employees aged 18-25 reported that they had already left a job due to caregiving responsibilities. 57% of employees left an organization to take care of a newborn or adopted child, 49% left to care for a sick child, while 43% left to manage a child’s needs. On the other hand, 32% left to take care of an elder family member with daily living needs and almost 25% left to take care of an ill or disabled spouse, partner or extended family member. The most significant factors that contributed to workers quitting were: the unaffordable costs of paid help (53%), the inability to find trustworthy and qualified paid help (44%) and the inability to meet work responsibilities due to the increased caregiving responsibilities (40%) – all areas where employers could provide guidance, infrastructure or support. View the issue of caregiving through a lens of talent management, rather than exclusively as another potential expensive benefit. Accept that the tension between work and caregiving expresses itself both financially and culturally within the organization. Demonstrate commitment both by acknowledging their employees’ care concerns and by investing in innovative solutions. Conduct a regular care census to identify the magnitude and nature of workforce care needs, evaluate the relevance of its existing benefits package and explore the plausibility of expanding it or developing customized solutions to capture the returns associated with boosting employee retention and productivity.